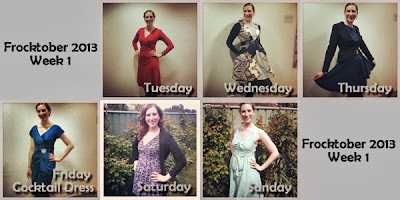 The first week of Frocktober was a little chilly, very windy but with enough sunny patches that the ubiquitous Frocktober cardigans could be put away at times. This Frocktober I'm upping the glamour stakes with cocktail dress Friday. It is particularly noticeable in my office because we embrace casual Friday so with one person in satin when everyone else is in denim I think it is quite clear that I'm doing something a little different. This week is the big one, Rock Your Frock. It is going to be a full on week which includes my birthday, a couple of dinners, a show and of course a huge charity dance. I expect it will be exhausting but fabulous. Good luck with Rock your Frock this year. Loved the photos from last year's dance.